Debra Winger. Photo courtesy of the National Institutes of Health. …Of these celebrities, Winger, a three-time best actress nominee at the Academy Awards, has been singled out as first to the party on the issue, though Ruffalo might be a close second. Winger was instrumental in helping to gain startup-style attention before the 2010 Sundance Film Festival for “Gasland,” the Oscar-nominated documentary about the natural gas industry, and has since been heavily involved in demanding the Cuomo administration keep fracking out of the Empire State. Yet Winger and others insist their anti-fracking movement isn’t about celebrity or capitalizing on fame. She says she is not an environmentalist and would have preferred to stay out of politics altogether, partly due to the perception that celebrities with too much time on their hands (or too little information) get involved with pet causes out of vanity. The story behind how Ruffalo got dialed into the movement, which Fox said is driven mostly by regular citizens, is similar. Ramsay Adams, founder and executive director of Catskill Mountainkeeper, an upstate conservation group, said he approached Ruffalo at a diner in Callicoon, N.Y., and got him to join a trip to Dimock, Pa., with environmental attorney Robert F. Kennedy Jr. in 2010. What Ruffalo saw in Dimock, whose residents have claimed illness due to shale gas extraction, was good enough to get the actor on board, Adams said. He believes this was in part due to Ruffalo’s energy but also because at the time there was a bit of a dip in activist motivation after failures in Congress to enact a national climate change policy. Today, Common Cause/NY, Catskill Mountainkeeper, Delaware Riverkeeper Network, Food & Water Watch, Catskill Citizens for Safe Energy, Center for Environmental Health, Citizens Campaign for the Environment, Citizens for Water, NYH2O, Damascus Citizens for Sustainability, Riverkeeper, Inc.,and Frack Action called on Governor Cuomo to scrap the Revised Draft Supplemental Generic Environmental Impact Statement (RDSGEIS) for high volume horizontal hydraulic fracturing (“fracking”) due to the extent of involvement by three firms who are members of the Independent Oil and Gas Association of New York (IOGA NY) in the preparation of the SGEIS. A new review undertaken by Common Cause/NY showed two more IOGA members worked on the SGEIS, bringing the total to three. The groups also asked for a full accounting of relationships between SGEIS reviewers and IOGA. IOGA NY is the state’s leading voice advocating for the gas industry and touting the safety and economic benefits of fracking. On its website, the group describes itself as “represent[ing] oil and gas professionals to the citizens and lawmakers of New York State.” Just last July, the organization received $2 million from Exxon Mobil to run a pro-fracking advertising campaign. Listed alongside over 200 other corporate members on IOGA NY’s April 22 letter calling on Governor Cuomo to open New York State to fracking are three engineering and consulting firms that were retained by the New York Department of Environmental Conservation (DEC) and NYSERDA during the preparation of the Revised Draft SGEIS– Ecology and Environment Inc. (E&E), Alpha Geoscience, and URS Corporation. Research, including documents produced in response to a Freedom of Information Law (FOIL) request, reveal that these firms were deeply involved in preparation of sections of the RDSGEIS response to public comments. The analysis of fracking’s socioeconomic impacts contained in the RDSGEIS was prepared by E & E and has been heavily criticized by environmental and public health organizations for failing to comprehensively evaluate fracking’s potential negative socioeconomic impacts. Although heavily redacted, the FOILed documents also show that E & E was intricately involved in the comment review and response process, participating in weekly reviews with government officials. Indeed, the documents show that, at times, E & E had nearly as many staff involved in the review process as the DEC itself. Alpha Geoscience was hired by NYSERDA to refute the analysis submitted to the initial SGEIS by one expert hydro-geologist, Tom Myers (who was hired by Catskill Mountainkeeper, Earthjustice NRDC and Riverkeeper Inc) which it did in a taxpayer-financed 57 page report. This earlier advocacy role raises serious questions about Alpha Geoscience’s ability to maintain an objective viewpoint during the RDSGEIS review and evaluation process. Similarly, URS Corporation, also consulting with DEC to prepare the RDSGEIS, was previously retained by NYSERDA to provide positions on water-related issues associated with gas production in the Marcellus Shale. The affiliation of E&E, Alpha Geoscience, and URS Corporation with IOGA NY raises disturbing questions about the firms’ role as supposedly impartial expert advisors to the DEC. With such close ties to the natural gas industry, these firms clearly stand to garner greater profits in the long run by serving the interests of industry rather than government, a common potential conflict of interest when industry-related consultants are tapped to perform evaluations and reviews by government. In light of these revelations, the groups question what further facts might be discovered which would reveal further industry influence over what was to be an objective and neutral government review and evaluation process. “It is ridiculous that multiple contractors with industry ties were hired by two agencies for huge sums of money, with the appearance of advocating for drilling. All the while we were told money could not be put in the Budget for a comprehensive Health Impact Assessment. It is certainly flattering that an industry consultant was hired to do specific review of our comments showing how contaminates will get into aquifers but this just reeks of government scandal,” pointed out Wes Gillingham, Program Director of Catskill Mountainkeeper. “New York’s environmental review process requires impartial expertise by the state. The taint of bias on the part of consultants they hired for this most critical review of fracking is the kiss of death, invalidates their findings and there’s no other choice but to throw out the entire report,” said Maya van Rossum, the Delaware Riverkeeper. “Unfortunately the conflicts of interest involving paid consultants retained by the DEC should surprise no one. The department’s Division of Mineral Resources has repeatedly shown itself to be little more than a captive agency of the industry it is supposed to regulate. It has misled the public about the chemical ingredients used in fracking fluid, and concealed the hundreds of drilling accidents that have endangered New Yorkers in the past. A thorough housecleaning is in order,” said Bruce Ferguson of Catskill Citizens for Safe Energy. “Fracking is a dangerous process that can make people sick. We can’t afford to leave New Yorkers’ health in the hands of the industry that stands to profit from fracking,” said Ansje Miller, Eastern States Director for the Center for Environmental Health. “In November 2011, Riverkeeper called out DEC Commissioner Joe Martens for the pro-fracking bias that pervades the state’s socioeconomic impact analysis. Nearly two years later, we learn that the firm who developed the socioeconomic impact analysis has ties with IOGA NY and that the entire RDSGEIS is in question. We need to wipe the slate clean and start over with an honest review. Until that is done, the process is fundamentally flawed and cannot justify public trust,” said Paul Gallay, the Hudson Riverkeeper. Gas drilling and fracking operations pose a serious threat to public health, with over a thousand reported cases of water contamination, sickness, and air contamination in other parts of the country where fracking is already happening. Our neighbors in Pennsylvania living in areas with fracking report health issues ranging from nausea, body rashes, nosebleeds, hair loss, asthma, birth defects, neurological and cognitive impairment and different types of cancer. Right now, New York Governor Andrew Cuomo is deciding whether to lift the state’s de facto moratorium on fracking or to allow the time for critical data to be developed from outside health studies before making a decision. In February, the governor’s own health commissioner, Dr. Shah, raised health concerns and pointed to three outside health studies currently underway that are “the first comprehensive studies of high-volume hydraulic fracturing health impacts at either the state or the federal level.” These studies could provide crucial data necessary to make an informed decision, particularly given major gaps in scientific knowledge about pathways of exposure and contamination from fracking. That’s why hundreds of New York’s medical and scientific experts are united in calling on Governor Cuomo to allow the three health studies his own health commissioner has cited to conclude, and to conduct a New York-specific health impact assessment that is transparent and includes public comments and hearings before making a decision. Those experts include internationally acclaimed scientists, medical professionals and long-standing health organizations like the American Lung Association of NY and the American Academy of Pediatrics NY. 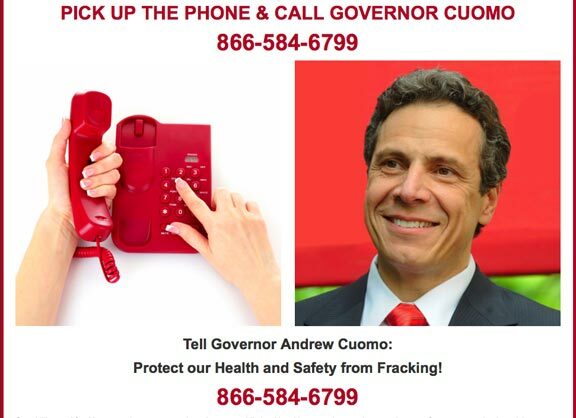 Unfortunately, Governor Cuomo recently said, “Nobody ever said we were waiting for the studies to be finished,” before making a decision on fracking. This flies in the face of the Governor’s promise to do the “most comprehensive health review ever done” on fracking before making any decisions. As the state’s own health commissioner Dr. Shah says, “the time to ensure the impacts on public health are considered is before a state permits drilling.” The health of New Yorkers is too important and must not be jeopardized by making a decision before the facts are determined. Call Governor Cuomo today to tell him that New Yorkers deserve nothing less than all of the facts and science before a decision is made. Our health and our future depend on it. The Quinnipiac University poll released today shows statewide opposition to fracking is growing. The new poll finds opponents outnumbering supporters of fracking in the survey by 46-39 percent — a new low for fracking proponents and the first time a “clear margin” has opposed it in Quinnipiac polling. Maurice Carroll, director of the Quinnipiac University Polling Institute stated that voters are “turning negative on the basic idea…” of fracking. Across the country, there has been a rising tide of citizen opposition to extreme energy extraction. From strip-mining for coal, to hydrofracking for natural gas, to the tar sands; more and more people are rising up to confront the devastating effects of extreme energy extraction on their communities – and people are increasingly seeing all of these struggles as interconnected – and ultimately about climate change. This is why people from all walks of life are stepping up and going to hearings, taking days off from work to be at rallies and in some cases making the personal choice of civil disobedience to stand up for what is right. Below is a story about one of these struggles. The blockade precedes a 250+ person rally opposing the Inergy facility scheduled to begin at the Watkins Glen Village Marina at 5 p.m. today. Twenty-five demonstrators blockaded the Inergy facility, which they say is one example of numerous fracking infrastructure projects that the New York State Department of Environmental Conservation (DEC) and Federal Energy Regulatory Commission have allowed to “slip in the back door” while New York Gov. Andrew Cuomo debates allowing the controversial and extreme process of horizontal hydraulic fracturing. Melisa Chipman, a resident of Schuyler County, where the facility is located said, “Not only do salt cavern gas storage facilities like Inergy’s have a very high probability of ‘catastrophic equipment failure,’ but I do not want more truck traffic polluting our air, destroying our roads, and scaring tourists away.” The DEC has received increasingly vocal criticism from local wineries and tourist businesses for refusing to conduct a comprehensive review of the potential environmental and economic impacts of Inergy’s plans to expand gas storage capacity of the current facility from 1.5 to 10.0 billion cubic feet. Activist, actor and Catskill Mountainkeeper board member Mark Ruffalo has spearheaded the effort to create a real plan for a renewable energy future for New York State. He, along with Academy Award nominated filmmaker, Josh Fox, put together a team of researchers headed by Stanford University Professor Mark Z. Jacobson (and 2012 Mountainkeeper Barnfest keynote speaker) to tackle the challenge. The result is the groundbreaking report released today, entitled “Examining the Feasibility of Converting New York State’s All-Purpose Energy Infrastructure to One Using Wind, Water and Sunlight“. Jacobson co-authored the report with Cornell University Professor of Engineering, Anthony Ingraffea, Cornell Professor of Ecology and Evolutionary Biology, Robert W. Howarth, and University of California at Davis scientist Mark Delucchi, among others. Their findings are published in the journal Energy Policy. The 64 page report crunches the numbers needed for wind, water and sunlight (WWS) to meet New York’s power needs by 2030 and shows us that the technology exists now to implement the plan and that it is economically viable to do so. The real question is whether our state leaders have the political wherewithal to make this happen. According to the study, if New York switched to WWS, air pollution–related deaths would decline by about 4,000 annually and the state would save about $33 billion – 3 percent of the state’s gross domestic product – in related health costs every year. That savings alone would pay for the new power infrastructure needed within about 17 years, or about 10 years if annual electricity sales are accounted for. The study also estimates that resultant emissions decreases would reduce 2050 U.S. climate change costs – such as coastal erosion and extreme weather damage – by about $3.2 billion per year. Currently, almost all of New York’s energy comes from imported oil, coal and gas. Under the plan that Jacobson and his fellow researchers advance, 40 percent of the state’s energy would come from local wind power, 38 percent from local solar and the remainder from a combination of hydroelectric, geothermal, tidal and wave energy. “Just over two years ago, on the southeast side of San Francisco, near the 101 freeway, RaboBank’s Executive VP, Marco Krapels, who manages its Capital Markets and Renewable Energy Finance Division, hosted a star-studded soirée at which he introduced the actor-activist Mark Ruffalo, Gasland filmmaker Josh Fox and Jacobson to renewable energy investors, social media influencers and well-connected environmental leaders. Many on the guest list were already aware of Ruffalo’s efforts to ban natural gas fracking in New York state and Fox’s work to expose the toxic hazards of natural gas-drilling. Guests had also come to learn of Jacobson’s Scientific American article — published a year earlier — which proposed that “a large-scale wind, water and solar energy system can reliably supply the world’s needs.” In that paper, Jacobson added, “the obstacles [to clean energy] are primarily political, not technical.” Many attending guests had watched Jacobson’s February, 2010 TED Talks debate performance, where he presented a compelling case in favor of a 100 percent renewable U.S. energy plan. Attention quickly focused on the Stanford brainiac, who offered the audience a refreshingly objective examination of his work. “Mathematics can be used to estimate the likely outcome of a new idea,” Jacobson began. He explained that his team was busy researching U.S. energy usage from the point of exploration all the way through to the point of consumption. In doing so, they kept account of the “external” costs of each energy source. The respective costs and benefits of each technology became a mathematical profile of sorts and what they found was remarkable: “When you properly factor in the economic costs of natural gas and other fossil fuels — their burden on the environment, human health and the economy — the benefits of renewable electricity are not only indisputable, but they’re financially compelling.” Jacobson’s cocktail conversation made an impression as industry moguls and tech savvy pioneers exchanged attentive nods.